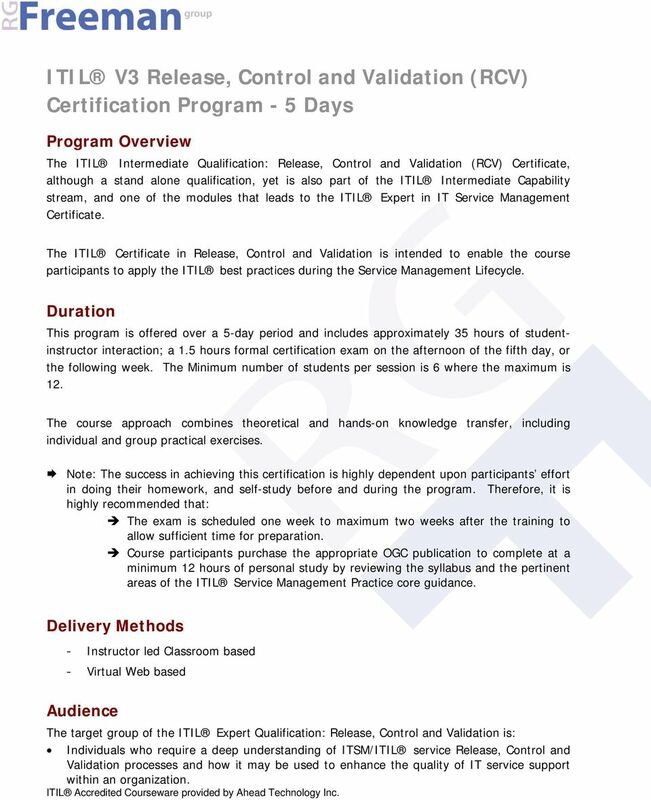 Download "ITIL V3 Release, Control and Validation (RCV) Certification Program - 5 Days"
1 ITIL V3 Release, Control and Validation (RCV) Certification Program - 5 Days Program Overview The ITIL Intermediate Qualification: Release, Control and Validation (RCV) Certificate, although a stand alone qualification, yet is also part of the ITIL Intermediate Capability stream, and one of the modules that leads to the ITIL Expert in IT Service Management Certificate. 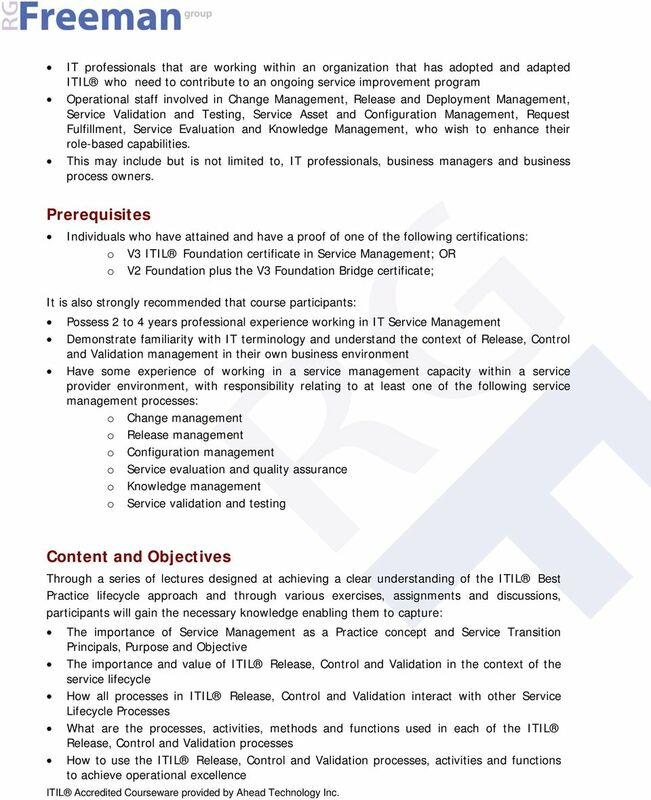 The ITIL Certificate in Release, Control and Validation is intended to enable the course participants to apply the ITIL best practices during the Service Management Lifecycle. Duration This program is offered over a 5-day period and includes approximately 35 hours of studentinstructor interaction; a 1.5 hours formal certification exam on the afternoon of the fifth day, or the following week. The Minimum number of students per session is 6 where the maximum is 12. The course approach combines theoretical and hands-on knowledge transfer, including individual and group practical exercises. Note: The success in achieving this certification is highly dependent upon participants effort in doing their homework, and self-study before and during the program. Therefore, it is highly recommended that: The exam is scheduled one week to maximum two weeks after the training to allow sufficient time for preparation. 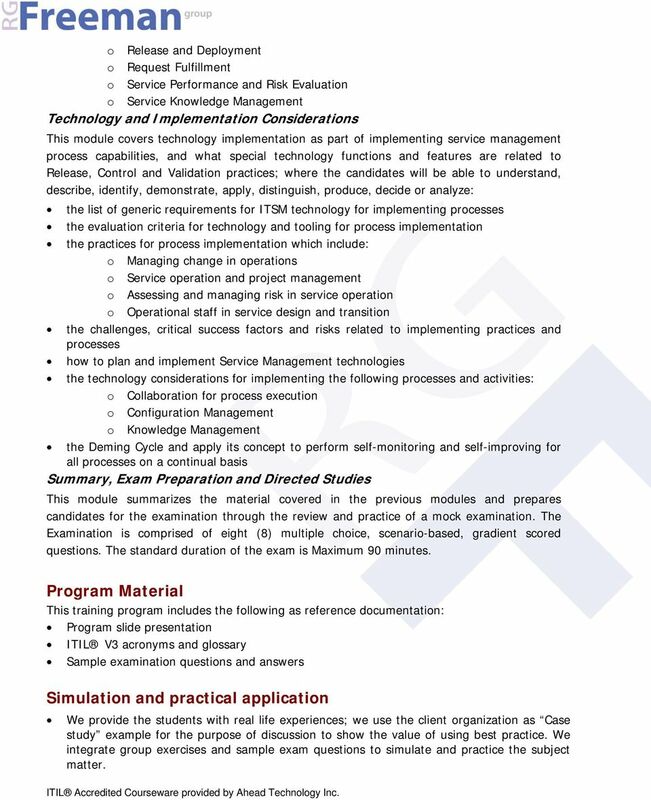 Course participants purchase the appropriate OGC publication to complete at a minimum 12 hours of personal study by reviewing the syllabus and the pertinent areas of the ITIL Service Management Practice core guidance. Delivery Methods - Instructor led Classroom based - Virtual Web based Audience The target group of the ITIL Expert Qualification: Release, Control and Validation is: Individuals who require a deep understanding of ITSM/ITIL service Release, Control and Validation processes and how it may be used to enhance the quality of IT service support within an organization. 7 o Release and Deployment o Request Fulfillment o Service Performance and Risk Evaluation o Service Knowledge Management Technology and Implementation Considerations This module covers technology implementation as part of implementing service management process capabilities, and what special technology functions and features are related to Release, Control and Validation practices; where the candidates will be able to understand, describe, identify, demonstrate, apply, distinguish, produce, decide or analyze: the list of generic requirements for ITSM technology for implementing processes the evaluation criteria for technology and tooling for process implementation the practices for process implementation which include: o Managing change in operations o Service operation and project management o Assessing and managing risk in service operation o Operational staff in service design and transition the challenges, critical success factors and risks related to implementing practices and processes how to plan and implement Service Management technologies the technology considerations for implementing the following processes and activities: o Collaboration for process execution o Configuration Management o Knowledge Management the Deming Cycle and apply its concept to perform self-monitoring and self-improving for all processes on a continual basis Summary, Exam Preparation and Directed Studies This module summarizes the material covered in the previous modules and prepares candidates for the examination through the review and practice of a mock examination. The Examination is comprised of eight (8) multiple choice, scenario-based, gradient scored questions. The standard duration of the exam is Maximum 90 minutes. Program Material This training program includes the following as reference documentation: Program slide presentation ITIL V3 acronyms and glossary Sample examination questions and answers Simulation and practical application We provide the students with real life experiences; we use the client organization as Case study example for the purpose of discussion to show the value of using best practice. We integrate group exercises and sample exam questions to simulate and practice the subject matter. 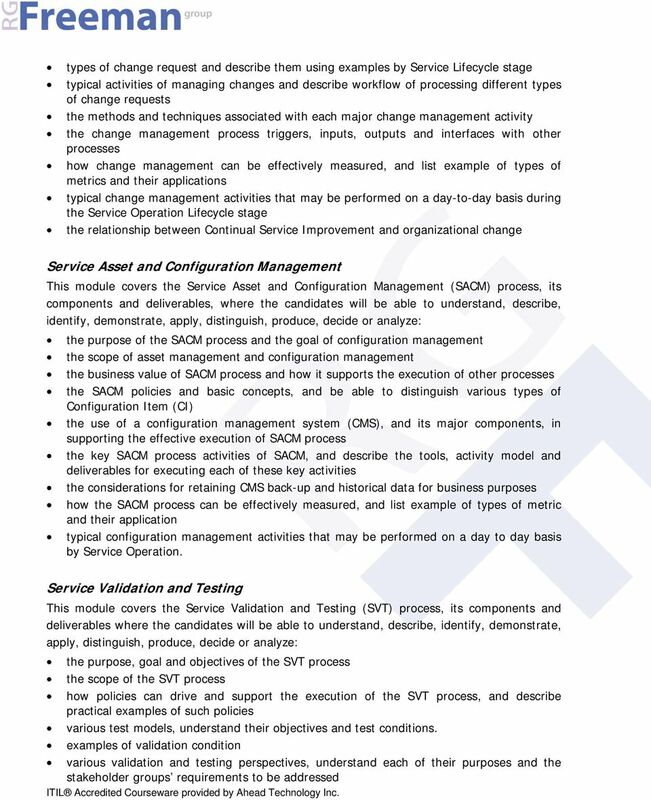 Configuration control ensures that any changes to CIs are authorized and implemented in a controlled manner. 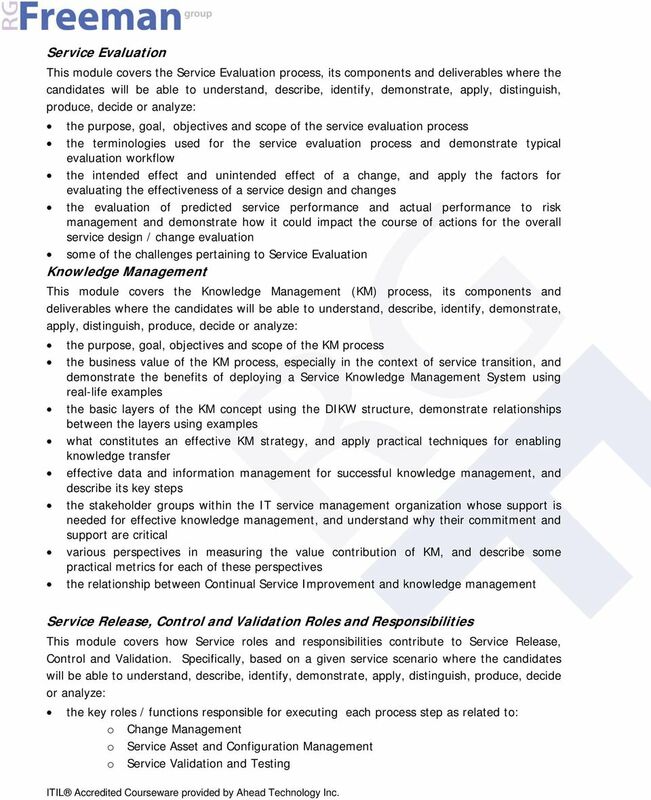 ITIL Service Management Practices V Qualifications Scheme ITIL Service Management Practices Contents 1. Scope and purpose of document 3 1.1. Synopsis 3 1.2. Suggested reading 3 2. 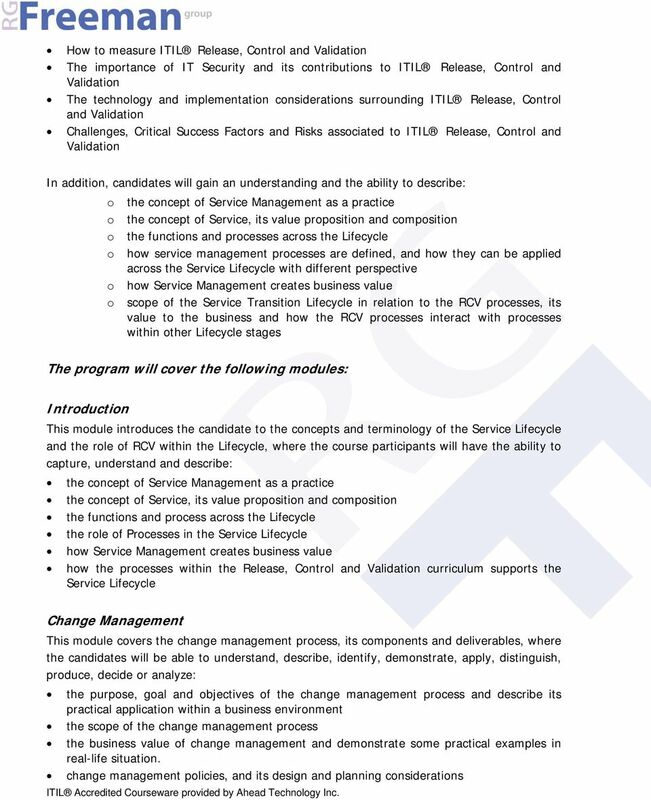 ITIL Overview 3 2.1. 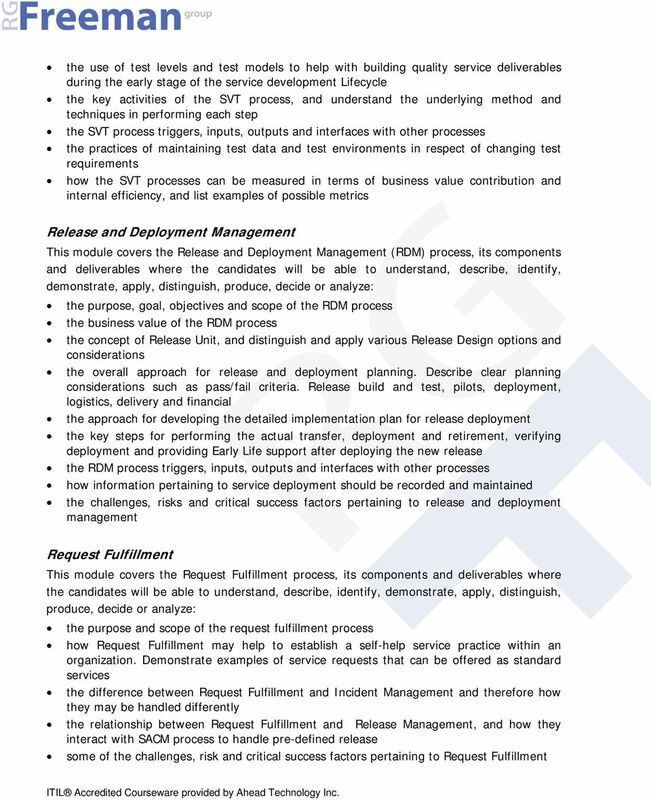 Incident Command System Training Guide Course description ICS - 100 Introduction to ICS is intended for personnel assigned to an incident or event who have a minimum requirement for understanding ICS.